A first cousin to Her Majesty the Queen – and with an interest in heritage railways and steam locomotives – Prince Richard, the Duke of Gloucester, visited the line on Friday 8 June, accompanied by the Lord Lieutenant of Dorset, Angus Campbell, who is the Queen’s representative in the county. During his visit, the Duke of Gloucester also unveiled a blue plaque in the booking hall of Swanage station marking the Peter Manisty Award from the national Heritage Railway Association which was given to the Swanage Railway in March of this year. 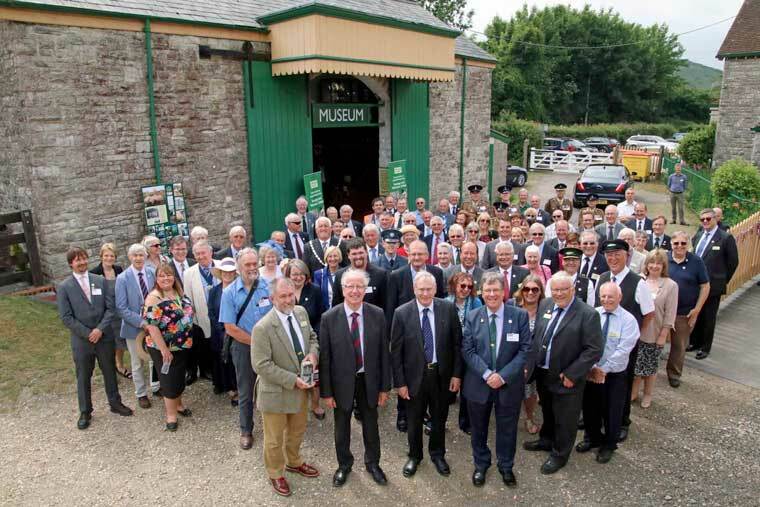 The national excellence accolade recognised the Swanage Railway’s achievement in reinstating the line to Wareham and returning trains from Swanage and Corfe Castle to the main line at Wareham during a trial in summer 2017. Arriving at Swanage station, His Royal Highness was welcomed by Swanage Railway Trust chairman Gavin Johns and Swanage Railway Company chairman Trevor Parsons, as well as the town mayors of Swanage and Wareham and the chairman of Purbeck District Council. Moving into the station booking hall, Prince Richard was introduced to Swanage Railway’s trustees, directors of the Swanage Railway Company, officers of the national Heritage Railway Association as well as volunteers and staff on the award-winning line. The Duke of Gloucester and the Lord Lieutenant of Dorset then boarded the ‘Wessex Belle’ dining train – along with more than 70 other guests for a trip to Corfe Castle where five Swanage Railway volunteers were presented with the Queen’s Award for Voluntary Service crystal trophy. The Duke of Gloucester and Angus Campbell visited the goods shed museum at Corfe Castle station for the presentation of a Queen’s Award for Voluntary Service crystal trophy to five Swanage Railway volunteers. Prince Richard praised the Swanage Railway’s achievements and acknowledged the role several generations of volunteers played in rebuilding the line and reestablishing the rail connection with Wareham. He said, “It’s a great pleasure for me to be here today and have the very pleasant task of presenting the Queen’s Award for Voluntary Service, which has been created to acknowledge the important role that volunteers play in our national life. “In congratulating you, I hope that you feel a shared sense of pride in that what you could never have done by yourself, you have achieved by working together as a group of volunteers. I wish the very best of luck to the Swanage Railway,” added the Duke. His Royal Highness then presented the Queen’s Award for Voluntary Service crystal trophy to Swanage Railway volunteers Peter Sykes, Pete Frost, Heather Denning, Mick Stone and Aiden Wright. After the presentation, he cut a special cake marking the occasion before viewing a display about volunteering on the Swanage Railway and chatting to volunteers and staff on the line which has been rebuilt from nothing since 1976.